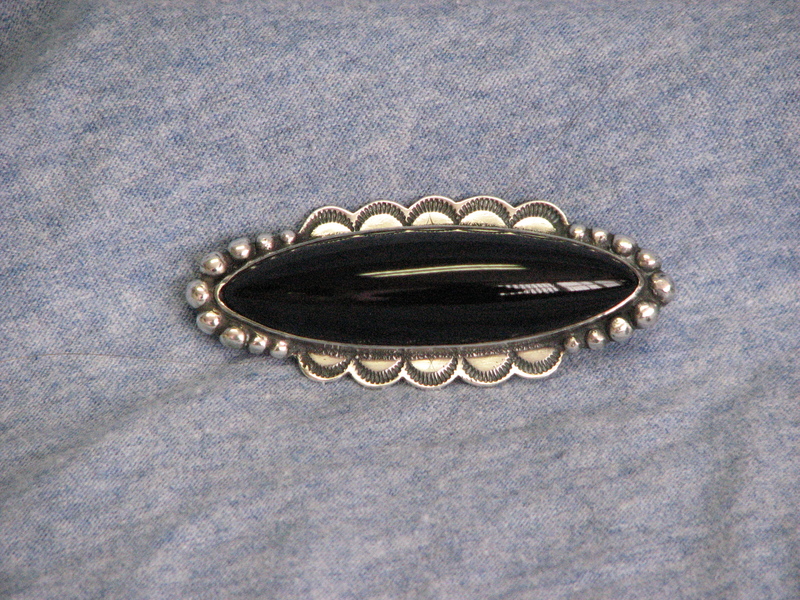 This silver pin made by award-winning Navajo silversmith Ambrose Roanhorse has a large piece of obsidian in the center. Roanhorse taught silversmithing at the Santa Fe Indian School in the 1930s. He was one of the first native artists to depart from traditional designs. Instead, his work is noted for bold lines, simple forms, and minimal stamping. When he used turquoise, they were generally single high quality stones. The pieces in our collection are excellent examples of his bold, simple forms and use of high quality stones. Our collection is unique in that it also contains obsidian and moonstone in addition to the turquoise stones. This entry was posted in Collection Notes and tagged A-Z, ambrose Roanhorse, brooch, Cleora Helbing, jewelry, Navajo, obsidian, silver, silversmith. Bookmark the permalink.